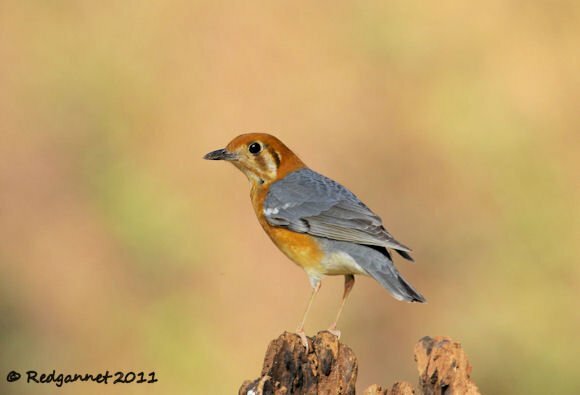 The Orange-headed Thrush, Zoothera citrinus, is common across much of India and south-east Asia. It likes well wooded areas with a preference for shady gullies and damp areas. It is usually resident, but this individual, which was seen in Hong Kong, is a winter visitor there. Most migration is altitudinal with the birds reaching as low as 250 metres above sea-level during winter. 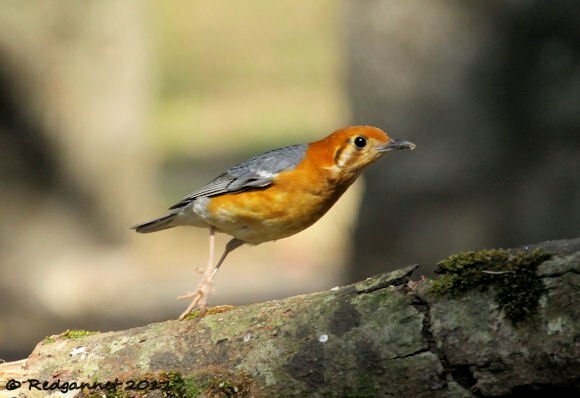 Orange-headed Thrushes were not recorded in Hong Kong until 1956 and they are still very scarce. The former British colony’s Z.c. melli strain is one of as many as 12 races and shows a lighter face than many of the others. To describe the back as grey makes it sound very drab, but in good light it takes on a bluish hue. Informed literature bears out my experience that most birds are seen singly or in pairs. Outside of the breeding season a few birds may join together in a loose flock if the feeding is good. One feature that I can find no mention of in any of the literature is the appearance of filaments on the nape of this bird. The resolution has been reduced for the blog, but in high-res, 2 or 3 dark filaments are visible. This individual is a male. The female and juvenile are browner on the back, though a female may resemble the male with age. A three-part trip report for Hong Kong including the Orange-headed Thrush and visiting Tai Mo Shan, Cheun Lung Family Walk, and Aberdeen Reservoirs, can be found on Redgannet. This bird is disgustingly beautiful. Great shots! Redgannet, almost all song birds at least in North America (and the Orange Thrush sure won’t be the only old world bird to have them, too) have these filamental plumes on their nape. I know there was a blog post up somewhere, maybe on Net Results or Bootstrap Analysis, but I can’t find it now, it’s been quite a while. These filaments are really difficult to see even on photos. Their function? 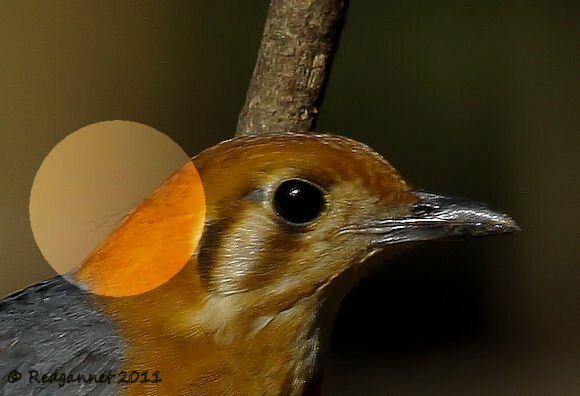 Speculations back then on the blog post were that they tell the bird if its feathers at the back of its head are in order or not. But that was – so far as I know – just speculation. They could be for something entirely different. Beautiful bird and great shot. Bravo! Awesome photos of the colorful bird. Some grand closeups!! Boom & Gary of the Vermilon River, Canada. What a stunning bird, and such a rich colour. Great photos! Interesting bird! Will be looking for follow-up on the filaments. A beautiful bird to see. Great images. Super photos of this very beautiful bird! Awesome series of a remarkably beautiful bird — really terrific shots! 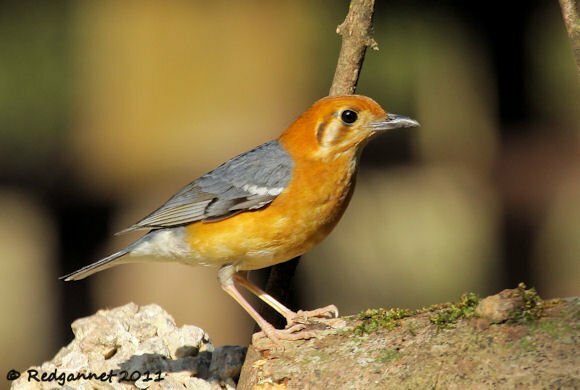 What an exotic bird is your Orange headed thrush! Your photographs are are so beautifully taken and make for an exciting series. I also got a kick out of your bio. Married to a Canon? That I understand! WOW do you think the filaments are an evolutionary thing..maybe it was a bird of paradise at one time? Very interesting species. I believe the filaments are specialized feathers called filoplumes. They are most visible on the napes of passerines. As Jochen said, they are theorized to help birds keep their feathers in order. These feathers are usually under the contour feathers over the whole body. Lovely pictures…but is this Z citrinus or cyanotus….? @ Owler, thanks for a dazzling new word that I shall try to work into my next post. @ Jochen, I am coming to think of you as the fount of all knowledge. Thanks for your thoughts on the filoplumes. @ Flowergirl, I believe this individual to be the Z.c. melli form. Note that the lighter markings around the face and throat are undefined and subdued. In the Z.c. cyonotus race. the white markings are much brighter and more defined. Z.c melli is the Hong Kong form that visits during the winter from southern China. 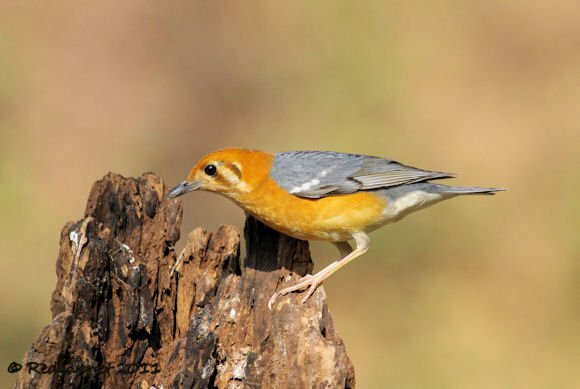 Z.c cyanota is more commonly found in peninsular India and is sometimes known as the Indian Orange-headed Thrush. Hi, I saw your website and was hopeing you could help. I live in Denver Colorado. 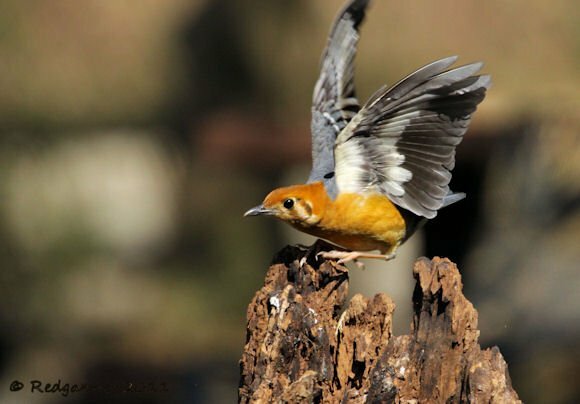 I am seeing a new bird in my backyard, the boy has a yellow chest and neck,black wings and back back with black mask and orange hood. The girl is same but no orange crown. Do you have any idea what kind of bird this is? Sorry for taking so long to reply. I suspect that the chap you are seeng is the Western Tanager. I am surprised to find that there are no pictures at this site, but try this link and see if the pictures here match your birds.